There aren’t many authors that are able to motivate you so much as to actually help you gain control over your life and develop a framework for accelerating it. Robert Kiyosaki is definitely one of them – and in ‘Rich Dad, Poor Dad’, he proves why his words are meant to inspire action. While most people will categorize this book under ‘Investment and Money’, the first thing you need to understand is that it is really not all about the money. This book is written to trigger our mind out of the comfort zone we are in. The mental models make us aware of a system that teaches us how to think and what actions to take during our lifetime. The main inspiration which can also be noticed in the name of the book comes to Kiyosaki from the two father figures that were present in his life: his biological and his friend’s father. Categorizing both of them as fathers, Kiyosaki reveals how different their perspectives are when it comes to money and financial decisions – and which perspective is made to prosper. In a nutshell, both of his fathers looked at money from a different angle. And in reality, a lot of things are viewed from the same angle, which is why we must view situations in as many possible perspectives as possible. For example, going to college, getting married and raising a family are directions society wants us to accept. Buying expensive stuff to boost our ego and make false impression of ourselves is another one. We must be able to perceive freely and understand things for what they truly are to truly understand how systems work. As Kiyosaki states, we don’t need anything that we haven’t earned to maintain an image. Moreover, he signifies the importance of our motives – and how being motivated by not just money but the world around us can help us succeed. Being educated does not always mean being smart. Lessons can be learned anywhere and at any time, and all we have to do is accept that we are all equal from the start. When it comes to financial investments and money, Kiyosaki provides well-informed fundamental financial tips. He explains all the concepts in a visual fashion, using diagrams to back up his theories and detail important things accordingly. Unlike many other books on investment and money preaching the ‘do’s and don’ts’ of investing money, ‘Rich Dad, Poor Dad’ is a smart guide to making money work for you. Obviously, there is no one-size-fits-all formula to making money and being successful, as it all lies inside each one of us and how we allocate our time and assets. In his blog, Kiyosaki covers this from an entrepreneurial point of view and an outside-the-box thinking. The true mastery of Kiyosaki is his balanced approach to both of the father figures and the decisions that made (one of) them successful. Through detailed six lessons, he explains how his rich dad taught him to change the normal perspective and always use a different way of thinking. The applicable solution to financial despair is through the accumulation of assets and reduction of liabilities. Assets let money flow in and liabilities make money flow out, so in order to achieve financial independence one must accumulate assets and diminish liabilities. For example, investing money in property is adding asset value, which can pay reasonably well in the future to pay off expenses. Remember that a home will come with liabilities such as insurance, taxes, etc which must be accounted for. The important thing is to know the long-term cost in terms of assets and liabilities that must be paid each month before taking on major financial decisions. In short, the crux of the book is to never depend too much on your job and education as it all can fall apart with downsizing. Instead increase your asset portfolio and find ways to earn more money. Once your assets are successfully generating cash flow, rather than buying things and turning them to liabilities, re-invest the cash into other assets to accelerate your income earning potential. This allocation of assets is how the rich become richer because they know and follow the simple tactics of making money the right way. What we can learn from this book is that life throws us a lot of opportunities and risks over its course and money, although essential, are a reality only for the people who know how to change their thinking and step out of their comfort zone. 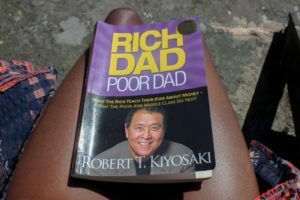 Rich Dad Poor Dad, the #1 Personal Finance book of all time, tells the story of Robert Kiyosaki and his two dads—his real father and the father of his best friend, his rich dad—and the ways in which both men shaped his thoughts about money and investing. The book explodes the myth that you need to earn a high income to be rich and explains the difference between working for money and having your money work for you. 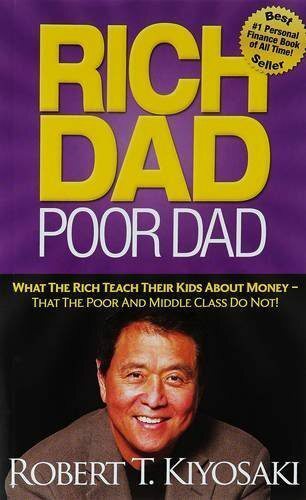 Rich Dad, Poor Dad is known as one of the world’s bestselling financial guides. Clear, well-written and definitely thought-provoking, it is a book that will make you change perspective on the flow of money. The book is more like an overview rather than an actual how to guide, but it provides enough fundamental knowledge to really impact your mode of thinking. A graduate of University of Southern California from Los Angeles, California with a Bachelors of Science in Industrial & Systems Engineering and an SAP Specialization. Jeffrey Ito is an entrepreneur who loves new technologies such as 3D printing, Neural Interfaces, Bitcoin, and iPhone apps. He is the Founder of Lithium Gold, Inc and Digital Green Tea - more than an SEO company. We are an experience founded on teamwork, transparency and achieving massive results. Jeff enjoys helping people gain an edge with 21st Century break-through technologies. His ultimate vision is to create optimized technology systems that help improve the lives of other people. If there's any questions, comments or feedback you have for me - feel free to contact me at any time. Are You Psychologically Prepared To Be An Entrepreneur?